Since 1998 there have been 32 teams competing at the World Cup, and that is expected to be the same in three years. “The World Cup will take place in Qatar with 32 teams. Obviously, if we can increase it to 48 teams and make the world happy we should try it,” Infantino told the Dubai International Sports Conference today. Email “Fifa exploring possibility of 48-team 2022 World Cup - Infantino”. 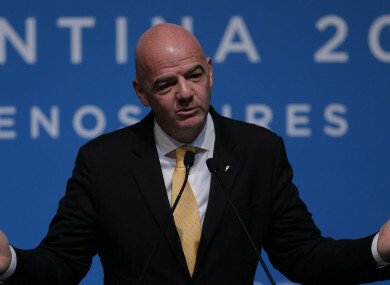 Feedback on “Fifa exploring possibility of 48-team 2022 World Cup - Infantino”.